The Turf Wars have started in Inkopolis, and the team that inks the most ground will be crowned the winner! Goggles and Team Blue are ranked lower than their competitors. But with some teamwork and a touch of creativity, they might just leave their mark on this tournament! 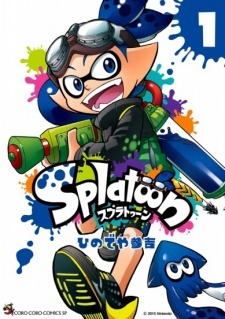 Splatoon is an adaptation of the Wii U action-shooting game of the same title. The series has been published in English by VIZ Media since December 12, 2017. It has been licensed in Spanish by Norma Editorial.